When Capt Andy fished with captain Troy Bruce and mate Ryan Young of Bruce Brothers Charters out of Prince Edward Island, Canada they suggested there was no need to wait until September to visit them. 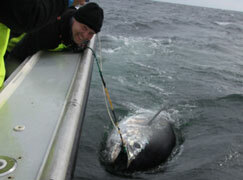 This is simply the best giant bluefin tuna fishery in the world and a “bucket list” trip for any serious angler. He took their advice and this past weekend Capt Andy and Steve Palmo released three giants of 700, 900, and 950lbs (112″) all on stand-up gear. There are three ways to fight these fish. 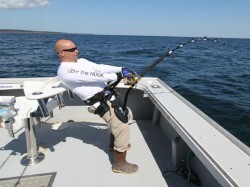 You can fight them from a traditional fighting chair, in the rod holder (Wicked Tuna style), or using stand-up gear. 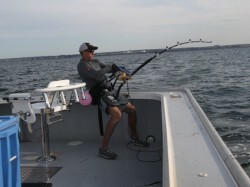 The fighting chair is what most anglers are comfortable with and is a great fishing experience. Using the gunnel rod holder is certainly the easiest way and still requires some serious strength and good technique. If you dare to use stand-up gear (our choice), you need to click here! 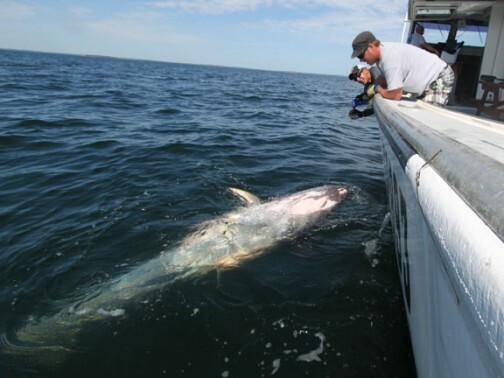 Captains Troy and Jamie Bruce are incredibly talented and we suspect they catch and release more giants in a single season than the entire Northeast US fleet. 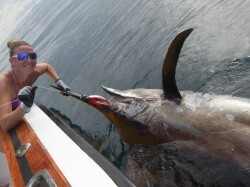 Visit the Bruce Brothers Charters website to learn more and book a trip (tell ’em we sent you!). 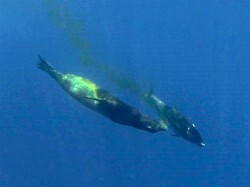 They are 100% committed to protected the fishery and playing by the rules (one and only one release per half-day trip). 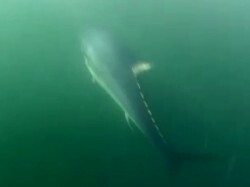 The other captains in the fleet all share the same commitment and together they have made this the finest giant bluefin recreational fishery in the world. We have only fished with one mate so far and he is one of the toughest wire-men in the business. We will be sharing a video showing just how tough he is. His talents extend well beyond his wire work and he and Troy are a very good team.